I would describe myself as a competitive person because once I have my sights set on something, I do whatever I can to reach my goal. After the shortlist announcement and the reality set in that I was in the Top 25, it was time to scope out the competition to see what I was up against. After checking out the competition, what’s cool about all of the Chief Funsters who were shortlisted is that we all took a different route of how we would get to Chief Funster. Everyone has a different personality. This makes the contest fun and diverse and I can only imagine how hard it is for you to have to compare apples and oranges to pick your Top 3 “shining stars” for Chief Funster. I have been following my competition closely and it’s been challenging for me because although I truly want to be Chief Funster, I have to admit that the competition is fierce and I really like what some of the other contestants have been doing. I keep wondering who will make it to Top 3 and if I will be one of them. If I am, how will I feel about the other two people who would stand beside me? Although one of my favorite parts of life is meeting new people, I never expected to find a friend in this contest. Over the past week I’ve gotten to know Shay Mirza and if there’s anyone I’d like to see in Top 3 with me, she is one them! Shay is glitz and glam, which makes her perfect for the eye of the public, but the best part about her is that she is authentic. I never expected another contestant to be so supportive of everything I am doing to win especially when we are competing for the same position. Shay has been such a great team player supporting myself and a couple other Chief Funsters while also doing what she needs to in order to make it to Top 3. Shay and I have been talking non-stop about the contest about all the “ifs” plus next steps. It’s been very nice to have someone in the same position as I am to talk to. I keep forgetting we are “against” each other. I wish we could both be Chief Funster. If I had to describe Shay in three words they would be thoughtful, thorough and fabulous! What I respect most about Shay is how she composes herself and her resilience. What most people probably don’t know is that Shay has been receiving cruel messages on her blog from an anonymous commenter. Shay has not let this bother her or get the best of her. Obviously getting nasty messages from someone who doesn’t even know her is not a comforting scenario, but Shay has risen above this radical behavior and has only let it make her stronger and more confident in this competition. I know Shay would make a fun-tastic Chief Funster, which is why you should to pick Shay Mirza to advance to Top 3! 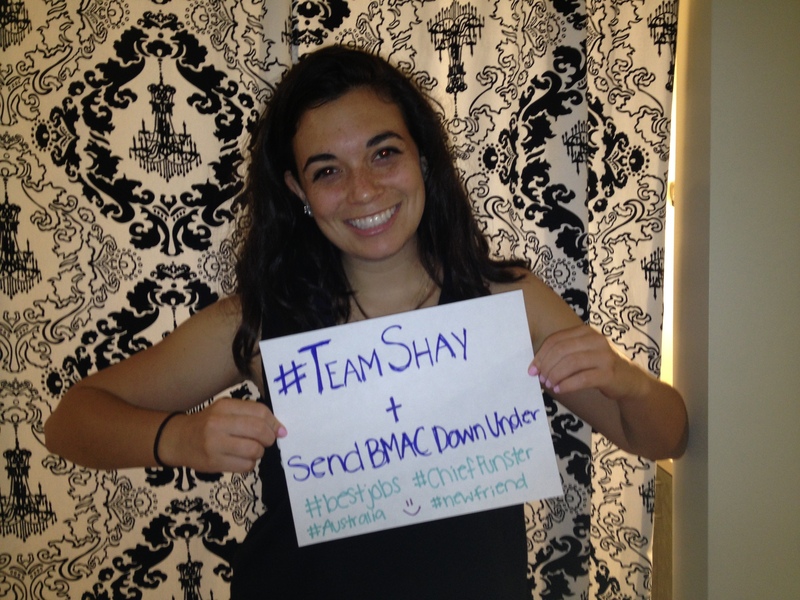 I’m on #TeamShay! Posted on May 11, 2013, in Round 2 Blogs and tagged #TeamShay, Australia, best job in the world, best jobs, BMAC, Brittany MacLeod, Chief Funster, New South Wales, Shay, Sydney, top 3, Tourism Australia. Bookmark the permalink. 2 Comments. It shows great confidence & sportsmanship to develop a friendship with, and recognize the good qualities in, one of your competitors. Confidence & sportsmanship are certainly excellent qualities that will serve you well as Chief Funster. I also like your approach to life that it is more important to be a great person regardless of the contest you may be in. It is clear that BMAC will make a great Chief Funster regardless of whether Australia picks you or not. Keep being BMAC! It will serve you well in everything you do … even when you go to Australia (which I’m sure you will) !